^ a b Quickfacts.census.gov - Delaware County Archived 2011年7月9日, at WebCite - accessed 2011-12-06. 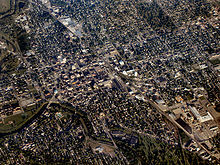 ^ Quickfacts.census.gov - Muncie, Indiana Archived 2012年8月6日, at WebCite - accessed 2011-12-06. ^ De Witt Clinton Goodrich & Charles Richard Tuttle (1875). An Illustrated History of the State of Indiana. Indiana: R. S. Peale & co.. pp. 556. http://books.google.com/books?id=YDIUAAAAYAAJ. ^ Gray, Ralph (1995). Indiana History: A Book of Readings. Indiana University Press. pp. 187. ISBN 0-253-32629-X.